The Barony-Marche of the Debatable Lands – the Barony of bridges… We have so many bridges in our great lands that connect our populace. We have many little villages with vast cultural diversity. There is another saying in our lands. Some people have never ever left their village because they will not cross a bridge. This was NOT the case when it came to a recent demonstration at the Carnegie Science Center for a Science After Dark Over 21 Event. 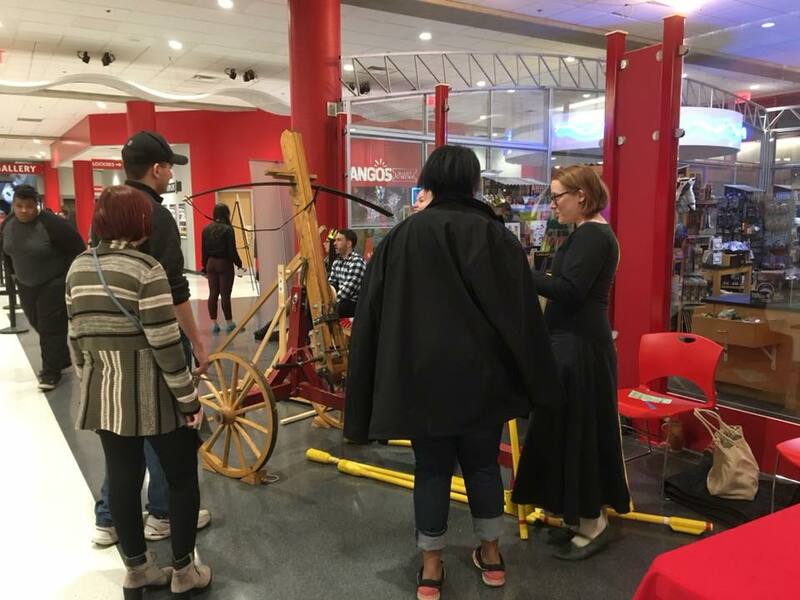 One of our residents reached out to our Chatelaine with the option to be involved in an evening demo that wanted to showcase what Pittsburgh had to offer in regards to all things medieval. There was a small little catch to this offer – it was only 20 days away! That is really not a lot of days to figure out the details for an event and a venue that you have not been in before. I accepted the challenge when asked to organize the demo. I figured – alright – I can get enough people and display items to man a table at this event. I should be able to do this no problem. First step: Meet with the main coordinator for the details. He is with the local HEMA branch and found out that he was trying to pull everyone in that he could – he wanted armored combat, role playing, Ren Faire, SCA, and anyone else that we could think of to fill the Science Center. I only had one question at the end of the meeting – How much can I bring? His answer – Bring it all! And we did! Step Two: Put the call out for volunteers. Talk it up at the event we had that weekend. Spread the word! At that event I had both merchants commit to the demo! I had several people say, “put me on the list.” I made a Facebook event and started using the Barony’s social media outlets. I went to the Barony’s business meeting to make sure everyone was aware of the demo. Step three: Be humbled by the overwhelming out-pouring of interest. One post – one email – one message – over and over people wanted to be there and bring “all of the things.” People that I did not know – people that did not know me – offered to work together. Not only was this within our Barony, it was with neighboring lands – up to four hours away! There were a total of 111 people representing the SCA at this event! Working with other local interest groups was amazing. Although we had similar interests and cross over with our members, working together for events was not that common. We worked on building those bridges. We want to keep the bridges strong. The bonds were growing – but there were many logistical questions to be answered. Who was going to be doing what? 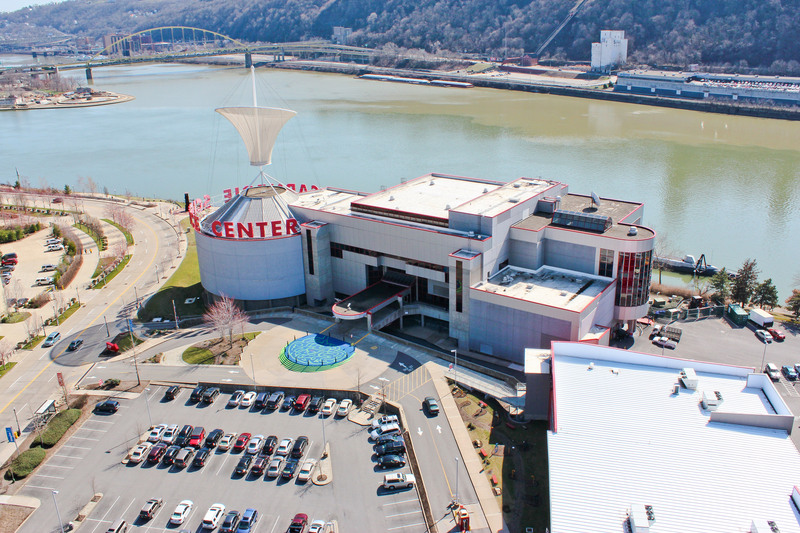 Where would be the best places for everyone to be at the Science Center? Did everyone have what they were going to need? We shared resources – we shared ideas – we worked together even up to the last few hours figuring out where a new interest group could fit in. There was no competition for space or times. We made it work. I personally had not worked with the Science Center before. A few of the other interest groups had – and they took us right into the fold. We were just all one giant family working together to put on a great event. The day of the event was glorious! Every person from every group united to engage the 1500 people in attendance – more than the venue had ever provided before. We hung banners – we shared radios – we shared dollies and helped everyone that needed help. The attendees were provided with so many options, confronted with choices such as, “Do I fight or do I talk about swords? Do I talk about A&S classes or thrown weapons?” I saw people moving from area to area talking to guests. There may have been 12 different groups at the event – but we melded into one. We shared our passion and our talents to guests that now have been given the tools to build the bridge from their village to ours. As Banners of Scarlet rang out from all four floors at the end of the evening, I couldn’t have been more proud of the Barony-Marche of the Debatable Lands, of Æthelmearc, and of the SCA. We crossed and built new bridges – we strengthened new and old bonds – we united as one voice. We are Æthelmearc! Article written and submitted to the Gazette by Lady Zianna.